Compared to the previous quarter, sales of fuels and other products increased (3.4% and 0.2% respectively), whilst sales of food products decreased by 0.5%. 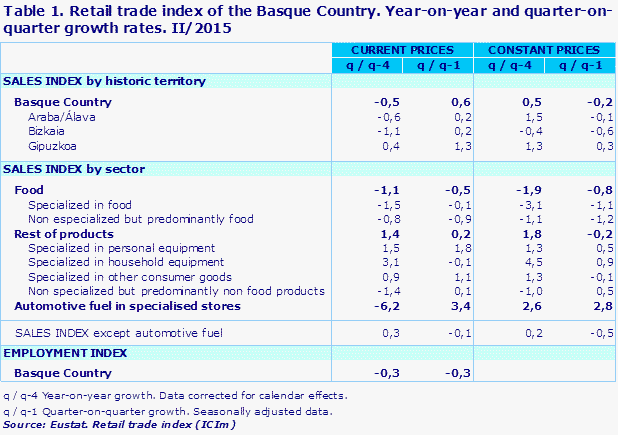 The retail trade sector of the Basque Country registered a 0.6% rise in nominal sales in the second quarter of 2015 compared with the previous year once seasonal factors had been eliminated, according to data provided by Eustat. Retail sector sales saw a year-on-year rate of fall of 0.5% in homogenous terms of the working calendar during the second quarter of 2015. However, if we discount the price effect, these sales increased by 0.5% in constant terms. By sector, food products registered a drop of 1.1% in nominal sales in the second quarter of 2015, retail trade of other products saw a rise of 1.4% and sales of automotive fuel dropped by 6.2%. In the retail food sector, specialised trade was down by 1.5%, as non-specialised trade in mainly food products fell by 0.8%. In retail trade of other products, there were rises in trade specialising in household equipment (3.1%), in trade specialising in personal equipment (1.5%), and in trade specialising in other consumer goods (0.9%), and a fall in the non-specialised sector mainly in other products, which was down by 1.4%. By province, there were decreases during the second quarter of 2015 in nominal sales in the retail sector in Bizkaia, which saw a year-on-year fall of 1.1%, and in Álava, which saw a drop of 0.6%, whilst Gipuzkoa saw a 0.4% rise in its nominal sales. For their part, retail trade sales, not including service stations, posted a upturn in constant terms of 0.2% with respect to the second quarter of 2014. In turn, the real decrease in retail food trade stood at 1.9%, while in retail trade of other products there was a rise of 1.8% with regards to the same quarter of 2014; for their part, retail automotive fuel sales were up by 2.6% at constant prices. Within retail food trade the year-on-year trend in real terms for specialised food trade was negative, with a fall of 3.1%, and non-specialised retail trade in mainly food also posted a downturn of 1.1%. In the trade of other products, there were rises in trade specialising in household equipment (4.5%), in trade specialising in personal equipment (1.3%), and in trade specialising in other consumer goods (1.3%), and a fall in non-specialised retail trade mainly in other products, which was down by 1.0%. Bizkaia posted a downturn at constant prices and in year-on-year terms of 0.4%, but in Álava and Gipuzkoa there were rises of 1.5% and 1.3%, respectively. With regards to the previous quarter, there was a fall of 0.2% in real retail trade sales in the Basque Country, once seasonal effects had been eliminated. The number of people employed in the retail trade sector in the Basque Country overall in the second quarter of 2015 was down by 0.3% on the first quarter of 2015.